Gated And Private Directly On East Coast Trail- Overlooking Bird Sanctuaries. Three beautiful acres in the historic village called "The Cribbies" in Tors Cove, NL. 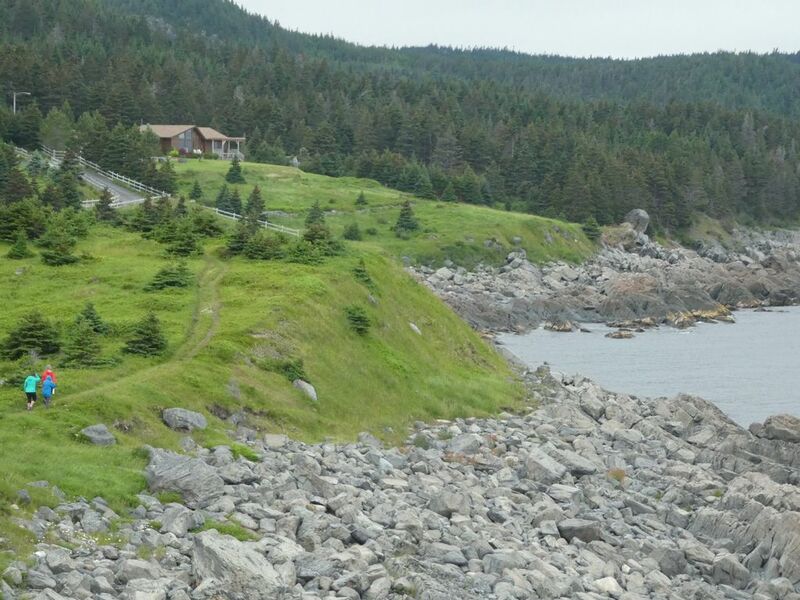 Located directly on the east coast hiking trail-overlooking the islands of the Witless Bay Ecological Reserve. Yet totally private and gated. The panoramic oceanfront views of majestic humpback whales, dolphins, eagles, sea otters & puffins make every day a special experience. Explore the miles of rocky cliffs & beachfront on your front doorstep! Mother Nature at her finest! Come experience the true beauty of "The Cribbies" showcased in Tourism NL Award Winning Commercial ("Architecture"). This beautiful A-frame cabin has 2 bedrooms (1 king bed & 1 queen bed); 1 fully wheelchair accessible bathroom, fully equipped kitchen, great-room (2 futons) & washer/dryer. It will feel like a home away from home. It is the perfect location to use as "home base" for exploring so many local attractions. Mistaken Point - UNESCO World Heritage site - is a scenic 40 minute drive up the Irish Loop coast. I fell in love with Newfoundland on my 1st ever visit there with friends. After many more trips to Newfoundland, I decided to look for a property in the beautiful province. After a long search, I discovered the property in Tors Cove; I immediately knew this was the magical place I had been looking for! It truly is my "peaceful place". I have been using a wheelchair for over 20 years now & needed a home that could be made to be wheelchair accessible. I found exactly that in Tors Cove! Our lovely A-frame bungalow is fully accessible to meet my needs. The breathtaking views of the ocean and the rich history of the area - combined with the wheelchair accessibility - made this the perfect home to fill our every need. Three beautiful acres located directly on the east coast hiking trail & overlooking the islands of the Witless Bay Ecological Reserve; yet totally private & secluded. The panoramic oceanfront views of majestic humpback whales, Eagles, sea otters, seals, puffins & more makes every day a special experience. Miles of rugged, breathtaking beachfront on your doorstep! Mother Nature at its finest! A perfect location for exploring the entire Southern Shore coastline. 3 piece bathroom. Wheelchair accessible. Wheel-in-shower. Washer and dryer in bathroom closet. Nothing short of spectacular. There was nothing we wanted that wasn’t right outside the front door. The sound of crashing waves, the ever changing ocean, the hiking trail directly behind the house, and all the amenities to make for a worry free stay. And Sandra and Frank were ready to help with anything we might need (though as it turned out, we wanted for nothing). Beautiful views, could see whales from our window, peaceful pond, quiet and private. This property felt exactly like a home! It had all the amenities that you could need. We needed a little help figuring out some of the things in the house and the homeowner responded within minutes! This location offers easy access to the southern shore, for day trips of hiking and boat tours, with local restaurants only 15- 20 min drive. Would absolutely go back again!! Four of us (family) came to Newfoundland for a rock gardeners’ conferece in St. John’s, and came south to the Tors Bay house afterward. Spent a truly relaxing week in a very special place (even for Newfoundland, which has many special places). A comfortable house with the most magnificent views of the cove and its islands was the perfect base from which to explore the villages and trails south of St. John’s. The great room picture windows were perfect for watching whales, puffins, loons, and the changing sea and sky. We did a lot of short hikes and beach combing, talked to the local folks, and made friends with a dog or two. It is a true getaway—not for folks who have to be constantly connected or who need their daily Starbucks and fast food. Bring your own groceries and use the well-equipped kitchen, or try the little local restaurants and bakeries. The caretaker for the house is local and a wonderful source of information of all sorts. He secured us the most wonderful halibut steaks for our final dinner—delivered with a lively account of local history! One caution—if you are driving a rental car, an SUV or other high-clearance vehicle is recommended—the access road to the house is not a public road and is hilly and quite rough. Cannot imagine a better place for a truly relaxing vacation—would make the trip to Newfoundland again just to stay at Cribbies Cottage. Thank you, Sandra, for sharing it with us. We have just returned from almost three weeks at this LOVELY oceanfront home. It was everything we had hoped for. Quiet, relatively remote and situated on the open ocean. The house had amazing views, a great room with cathedral ceilings but still down-to-earth. It felt lived-in---in a good way. Some small architectural details are still in progress but not at all bothersome. The bathroom was comfortable and there was good hot water and pressure. The kitchen was very user friendly. As in all vacation rentals we've occupied over the years, we wished there were more bowls, salad spinner, sharp knives, but there was a good selection of pots. Of note is the fact that the power lines etc. must be buried so there were no obstructions to the view and, when it got very stormy one night we didn't have to worry about losing power (at least I think that was the case---but the lights DID stay on and it was quite a storm)! The black flies came out towards the end of our stay and we were disappointed that there were no screens on the front and back door that would have allowed us to open them for air flow without getting those unwanted guests. There were ceiling fans that helped mitigate the passive solar heat of the great room but it made us wonder whether or not the heat would get uncomfortable in the hotter months. We understood that there were some windows without screens so that the view would be unobstructed but the doors don't fall into that category. The owners and their representative were extremely friendly and accommodating. Every person we met in the small village was eager to make us feel welcome. Truly pleasant! We recommend this property whole-heartedly and without reservation! And we're jealous of you already if you're getting to go! This is a fantastic cottage in an unbeatable location. The views from the cottage are spectacular, and the whole house is very well-appointed. It is in a very quiet location right on the ocean but it is still an easy drive to go and explore St John's, which is a fascinating small city. There is plenty to do in the area in good weather, with tours operating from Witless Bay and a good café (The Irish Loop) just up the road. Our only complaint was the requirement to wash the towels and sheets before we left. When you're paying over $350 a night this should NOT be part of the deal. We had to be at St John's Airport by 10 am on the morning we left so we had to get up pretty early to complete this task. However, we can still highly recommend this cottage - we have no complaints about the quality of the house for the price paid.